Are you prepared to pay for a Vet Emergency? The data, from pet insurance company Animal Friends, examined the cost of common medical procedures for cats and dogs per visit, and revealed the price discrepancies in different parts of the UK. Britain's owners of 8.5 million dogs spend an estimated £10.6BILLION on their pets every year, according to a new report, with an average owner splashing out £1,252 annually on their pet. With the increase of prices of veterinary and other pet services, from grooming and treats, to personal trainers and pet clothing, the total number of ownerships of pets that live in the United Kingdom have reduced, with almost a 12 million drop, since 2009, leading to the question of whether ownership is reducing due to expenditure? 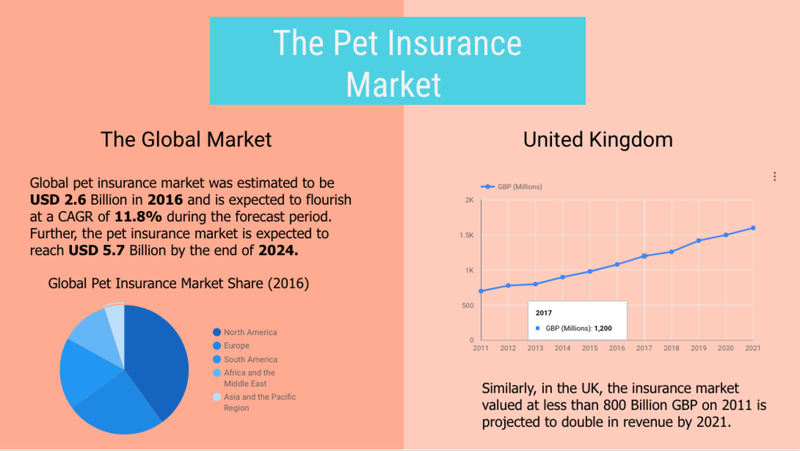 Global pet insurance market was estimated to be USD 2.6 Billion in 2016 and is expected to flourish at a CAGR of 11.8% during the forecast period. Further, the pet insurance market is expected to reach USD 5.7 Billion by the end of 2024. Given the market size of pets that are not covered by insurance, coupled with the increase in expenditure of the upkeep of pets, the pet insurance market makes an inviting potential for insurers facing relentless competition in more traditional markets such as home and car insurance. The research on this report was done by Mamta Kesharwani, RAP (Redwood Apprenticeship Programme) Intern, Redwood Algorithms; with assistance from Megha Malpani, Digital Analytics Consultant, Redwood Algorithms. Compilation and presentation was done by Shefali Mahender, Digital Analytics Consultant, Redwood Algorithms. The report was prepared under the guidance of Rajdeep Dutta, Head, Redwood Knowledge Centre.